Musa Point is a peninsula on the northeast part of the Karamja Island. Here you find a dock for fishing, a volcano, a banana plantation, and more. This peninsula was also home to the 2006 Christmas Event. So come on down to Musa Point. You might be surprised of what you will find. There are a couple of travel options you can choose from. 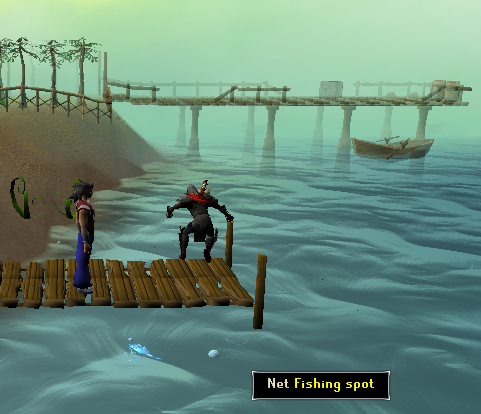 The most commonly used option is a boat from Port Sarim to Musa Point. Pay 30gp to one of the Seaman or Travel officers to be taken to the Musa Point boat docks. If you wear a Ring of Charos (a), then you can travel for free. The second option of travel is through the volcano. Players who are on Crandor Isle, from the Dragon Slayer Quest, can use the underground tunnel to go from Crandor to the volcano. The third option is to pay 30gp for a boat ride from East Ardougne to Brimhaven. Walk to Musa Point upon arrival at Brimhaven. The fourth option is to use Charter Ship Travel and pay a fee to take a boat to Musa Point. The fifth and last option is to teleport near the banana plantation using a charged Amulet of Glory. Options three, four, and five are for members only. This is where you will arrive if you are taking a ship to Musa Point. These docks contain two ships. The first ship will take you to Port Sarim for 30gp. The second ship is a Charter Ship. For a fee, you can travel to others ports around Runescape other than Port Sarim. A Ring of Charos (a) can be used to reduce the prices. When you are completing the Pirate's Treasure Quest, you will need to use the Port Sarim ship to smuggle rum to the pirate. However, the customs officers will check you to see if you are smuggling illegal items out of the island. Let's continue exploring Musa Point, as you might find a way to smuggle the rum. A bit northwest of the docks is a house that belongs to Luthas. Luthas is an NPC that owns the nearby Banana Plantation. His job is to collect bananas and put them in crates. These crates are shipped to the Port Sarim Food Store. This is how you can smuggle the rum back to the mainland for the Pirate's Treasure Quest. Place the rum into a crate and fill it with bananas. Once you have taken care of your rum smuggling, you can earn some money by picking bananas. Luthas will pay you 30gp for every crate you load with bananas. 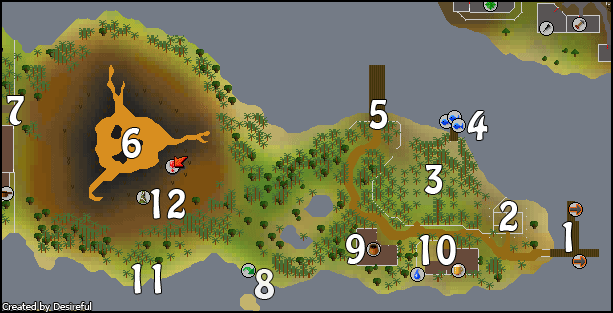 Behind Luthas' house is a spot where an air rune will respawn. West of Luthas' House is the famous Banana Plantation. Here you can find many banana trees. Bananas can be picked off the tree and then eaten, used to teleport to Ape Atoll, or placed in Luthas' crate for money. Players who are completing a treasure trail clue scroll might be asked to speak with Luthas. 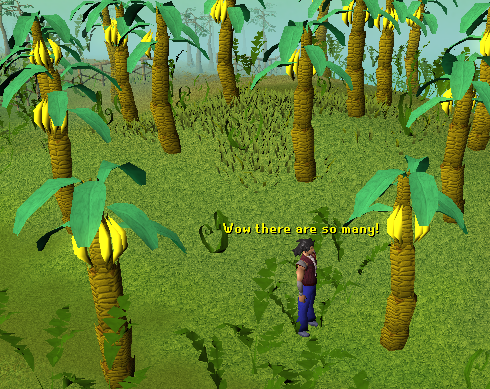 Luthas will give you a challenge scroll that will usually ask, "How many banana trees are in the plantation?" The correct answer is 33. North of the Banana Plantation is a Fishing dock. Here you can find about six fishing spots with options to Net, Bait, Cage, and Harpoon. Unfortunately, the closest bank to store your fishes is back on the mainland. If you want, you can sell your fishes to the nearby general store. West of the Fishing Dock is an empty dock. There is nothing interesting here. 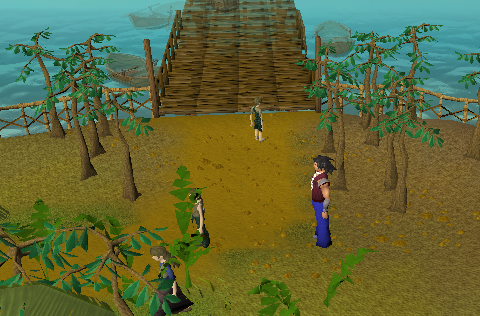 However, this dock was the start point for the 2006 Christmas Event. At the south end of this dock is a group of three children. Their names are Jack, Jill, and Jeff. They too played a part in the 2006 Christmas Event. Other than that, the children are just there to have a friendly conversation with traveling players. The Volcano is located west of all previous attractions. Here you can find some level 2 Imps and level 14 Scorpions wandering around the Volcano. On the east side, you can find a collection of rocks with a rope attached. Climbing down this rope will take you down into the Karamja Dungeon. At the east ending of the volcano, you can find some level 5 Snakes and level 3 Monkeys. West of the Volcano is a gate that leads into the city of Brimhaven. Brimhaven is connected to the rest of the Karamja Island. Unfortunately, any attractions past this gate are for members only. 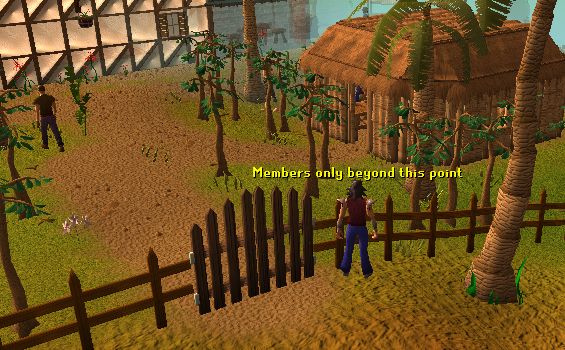 Musa Point is the only place free players can access on the Karamja Island. 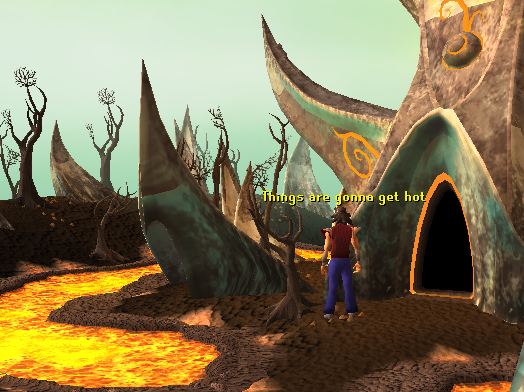 Southeast of the Brimhaven Gate and the Volcano is an Agility Shortcut. This shortcut will take you across the ocean to the bigger areas of Karamja. 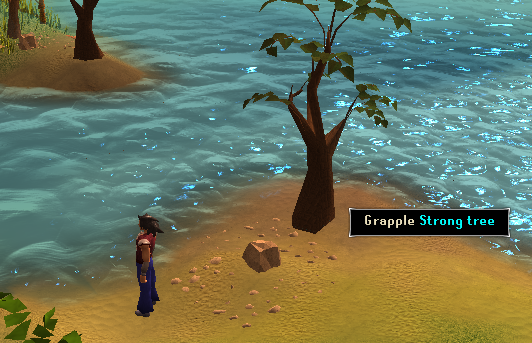 To use this shortcut, you need a Mithril Grapple Hook, as well as level 53 Agility, level 42 Ranging, and level 21 Strength. East of the agility shortcut is a general store. The store is owned by the Shop Keeper and the Shop Assistant. You can also find four respawn points of a Banana, a knife, a rope, and a jug in the building. East of the General Store is the Musa Point Pub. 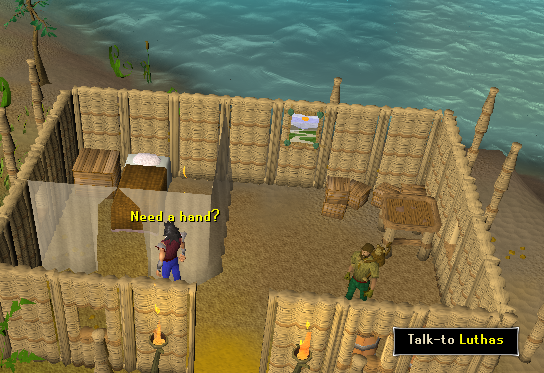 This is where you can purchase Karamjan Rum for the Pirate's Treasure Quest. Zambo is in charge of the shop and sells Wine, Beer, and Rum. Players who are completing the Alfred Grimhand Barcrawl will need to come to Zambo to buy Ape Bite Liquor. 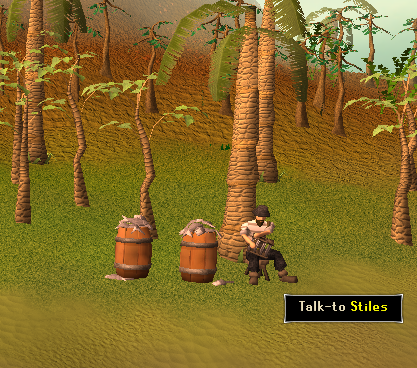 Stiles is located on the beach due south of the Karamja Volcano. He will note your raw and cooked Tuna, Lobsters and Swordfish for free. 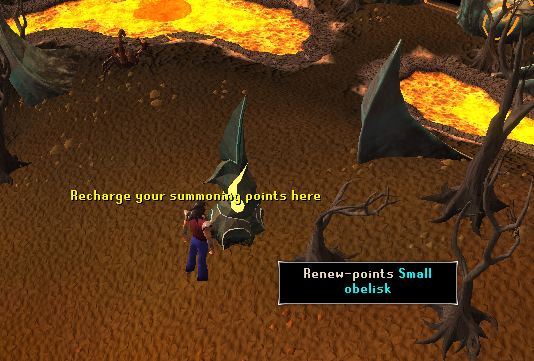 Just southwest of the entrance to the Karamja Volcano is a Small Obelisk, where you can recharge your Summoning Points.